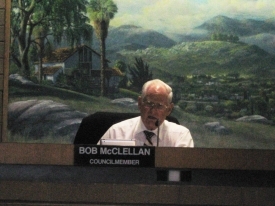 May 23, 2012 (El Cajon)--El Cajon Council drew applause yesterday when by a unanimous decision, Council members rejected a proposal to tear down the East County Performing Arts Center (ECPAC) and build a hotel on the site. Instead, Council agreed to work with community members and a newly formed ECPAC Foundation to reopen the theater long heralded as a centerpiece of El Cajon's downtown revitalization. 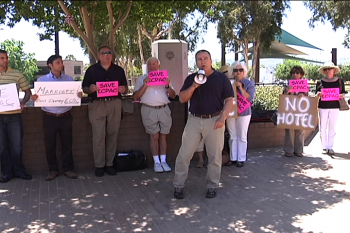 Before yesterday’s workshop on the theater’s fate, a rally to save ECPAC was held outside Council chambers. 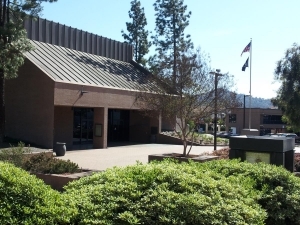 That rally was prompted by East County Magazine's discovery that the Council's consent calendar last week including putting an item on the agenda to dispose of "surplus city property" that is, in fact, the community's performing arts center. Ray Lutz, leader of Citizens Oversight Projects and former president of the Grossmont Community Concert Association, announced that concerned community members have formed an ECPAC Foundation as well as a separate SaveECPAC website. Those seeking to save the theater include arts aficionados, business owners, political activists and residents. At the workshop, developer E. Neil Arthur and an associate, Peter Wong, presented the proposal for development of a Marriott hotel on the site, which would include a 500-seat theater with a stage that would rise from the floor. Arthur contended that El Cajon would be an ideal place for a hotel as a destination for travelers entering the county from Arizona. His plan called for the city to set up a nonprofit to create the hotel and fund it through bond measures, then hire a hotel management group to run it for the city. But the plan carried risks. “If something goes wrong, the city may be on the hook,” Wong conceded. Even with legal protections, to avoid a public relations nightmare in the event of a potential default, some cities have been stuck stepping in to rescue similar hotel projects with public funds. “For every hotel built, I can probably pull up another where the community ended up paying,” he said. Councilman Wells voiced concerns over building a “spec” hotel, though Neil disagreed with the term. Wells asked if Marriott would still be interested in a hotel on another site. “I think they would be,” Neil replied. Specifically, Wells suggested a property on Rhea near Magnolia, close to ECPAC. The site was taken back by the state of California with other redevelopment properties statewide. “It might make more sense for the city to purchase that property, to have a hotel and a performing arts center,”Wells suggested. The Council voiced dismay to learn that no lender would be likely to fund the hotel project that Arthur proposed on the ECPAC site, nor would the builder invest any funds. He added emphatically, “I am not in favor of this. I would rather spend a little money, fix up ECPAC and move on.” The crowd applauded to show their support. Councilman Gary Kendrick also voiced opposition to “red flags” and to the city being left “on the hook” with negative cash flow from the ECPAC hotel site deal. “I taught finance at Southwest for ten years, so I know something about this,” he said. He objected to risking public money and noted that if the city were forced to cover a bond for a hotel it could mean cuts in police officers on the streets. ECPAC “could be made feasible, at least with some sort of subsidy,” he noted. Pro-tem Mayor Tony Ambrose also proposed that the hotel should be close to Magnolia , where it could be visible from the freeway. He called for separating the hotel and ECPAC projects, adding that he didn’t believe the ECPAC site was large enough for both. 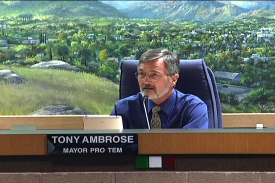 “I can see a real synergy where a new hotel would want to have a performing arts center nearby,” Ambrose said. 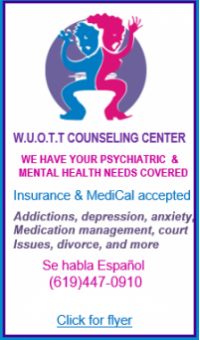 Arthur agreed that a large hotel should be “delighted” to help support having a successful performing arts center just down the street. “That sounds like a win-win,” said Wells. Arthur agreed, provided the state will sell the property back to the city. 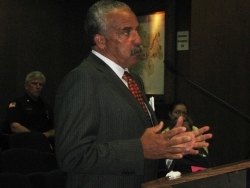 Mayor Lewis did not speak, though earlier Arthur indicated that the Mayor had insisted that any hotel plan include a bona fide albeit smaller theater. “He told me he didn’t want to see a gymnasium, but a state of the art performing arts theater,” Arthur indicated. The council’s decision to spare the theater comes as welcome news for merchants in downtown, many of whom have been struggling to keep doors open since the theater closed two years ago for a remodel that never occurred. After the state nixed redevelopment funds, some El Cajon insiders had predicted that the theater was doomed. “I’m sure that I speak for all of us here in saying that we all hope to see the theater open and thriving,” Wells concluded at yesterday’s workshop. He then asked for community partners to help the Council defer costs for the performing arts center, noting that in the past, the city has had to subsidize it for around half a million dollars a year. ECM editor Miriam Raftery offered to donate space in the magazine to promote the Save ECPAC efforts as well as to advertise initial programs once the theater reopens—ideally in time for the City’s Centennial celebrations this year. Lutz testified that the theater could be reopened for substantially less money than earlier City estimates of $4.5 million, which included non essential items such as moving an entrance to Main Street. After touring the facility with City staff, he estimated the theater could be reopened with just a good cleaning, though ideally $250,000 in improvements including roof repairs are needed. “When the theater first opened, citizens raised $400,000 for seating and lights,” he reminded Council. “We want to work with the city,” said Lutz, who said promoters working with the ECPAC foundation have offered up ideas that may make subsidies unnecessary or keep them minimal. 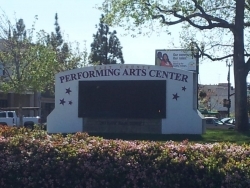 ECPAC Foundation members have proposed ideas to improve the theater’s financial viability, such as selling alcoholic beverages, improving marketing with use of online and social media, having a better mix of road shows and community programming, reaching out to groups wishing to rent the theater, and appealing to potential sponsors such as internationally acclaimed musical instrument manufacturers based in East County. “Can you put together a proposal?” Ambrose asked. Thanks to all who worked so hard to save ECPAC! We must commission a memorial plaque made to honor those who never gave up, who fought the fight, who spread the word, who demonstrated, and finally convinced the council to do the right thing! You really are El Cajon heroes! Residents and vistors will always be grateful for what you have done. God Bless You All.